Then came the long string of housekeepers. I hate hearing myself think these thoughts, but “It’s really hard to find good help.” There was the housekeeper who brought her boyfriend. He didn’t help; he just stood around reading the paper and watching her clean. Then there was the family who came in as a horde but never remembered any of the instructions from last week. “Please don’t use abrasives on the tub,” was our instruction every week as they sprinkled Comet or Ajax in the tub every week. Then there was the Cleaning Pimp. We had a service run by a man who brought a different woman with him every week. One time after the Cleaning Pimp and his moll left, my wife couldn’t find a certain pair of earrings. She was convinced the housekeeper took them, until she found them in the pocket of the suit she had on when she last wore the earrings. 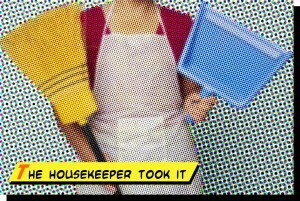 Now whenever something is missing, we joke, “The housekeeper took it,” even though we haven’t had a housekeeper in years. Now days, working freelance, I have a lot more free time and therefor a lot more house cleaning responsibilities. But like Charly from Flowers For Algernon, I’ve seen life with a housekeeper and I liked it better. Leaving me to wonder, “Where did all my free time go?” The housekeeper must have taken it.